Look what happened to the poor iPad mini! I'm a klutz, but it wasn't me. No, it was Natalie. She was listening to the music outside and she says the wind knocked it over to the ground. I guess it's partly my fault. I let her take it outside. But she's been taking it outside for a year now with no issues. I always tell her to set it by the door though. This time she decided to balance it on top of the garbage can lid and it went boom. She put it on the garbage can because she says "she could hear the music much better." It was Will Smith's daughter singing "Whip My Hair" by the hair. The iPad screen died because of that song. I swear it. Yes, she got in trouble. I reminded her how important it was take care of belongings. Tom told her the same. She cried when Tom talked to her because she hates to disappoint Daddy. We might eventually fix it. It's not a high priority with the holidays approaching so she'll have to deal with the cracked glass. At least it still works. 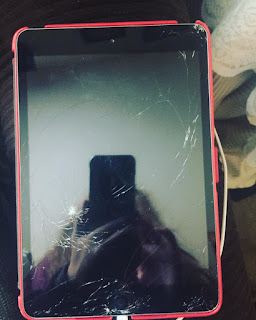 Has YOUR iPad or tablet screen ever been broken? You can replace the screen yourself. Just look up iPad mini screen replacement on eBay (other places sell them too) and you should be able to order one for $25. Tom should be able to install it once it arrives. Don't ask how I know these things. Haha. Thankfully that hasn't happened, but we have given our kids phones just for games and they've managed to break those pretty fast. I got a tiny scratch on my Kindle, but it's still readable so I'm not making a big deal out of it. I don't even know how it happened. I also dropped my old cell phone (prior to getting an iPhone) in the bathtub. That was the end of that! Ugh that's so frustrating! I definitely would replace it yourself much cheaper that way. My daughter knows that if she breaks her iPad, she's buying herself a new one. She treats that thing so carefully, it's ridiculous. I cracked the crap out of my old iPhone screen. Fortunately it was just in time for my upgrade! I'm sorry to hear about your ipad! I had something sort of similar happen. I always tell my son to make sure not to leave things on the floor. He was in his room and watching through the ipad. I guess it died and I didn't see it walking in and I stepped on it. Part of the glass cracked and I lectured him about leaving his things unattended. I never got it fixed since it's still working, but I did feel bad for stepping on it. I think it was totally the song that busted it. Hope you find a cheap fix. It hasn't happened to me but I constantly have to tell Scarlet to check herself. "It was an accident!" I'm sure it was, but it happened 17 times today, kid! I hope your iPad gets fixed soon. I've had to replace iphone screens. There is a place nearby called the screen doctor that does it. You may have a place close to you too. My husband is a pro at breaking the glass on an ipad or tablet. Luckily, he is pretty good at fixing it himself as well. My autistic 3 yo. has an iPad mini and I am thankful every day for the Otterbox cover I bought. She throws that thing up in the air, down the stairs, etc. and it's still fine. She will set it down on the end table and then stand on it to do a superman leap onto the couch and it survives. I'm actually shocked how well it has taken her abuse. Of course now that I have written this I'm sure she'll drop it onto a pillow and the screen will shatter.